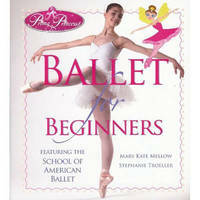 Prima Princessa invites budding ballerinas to explore the wonderful world of ballet! Is there any more enticing figure than the ballerina? Dressed in a fluffy tutu, wearing her pink pointe shoes, and dancing so gracefully, she's what every little girl longs to be. But what does it take to make that fantasy come true? Thanks to the charming, illustrated Prima Princessa, would-be ballerinas will enjoy a privileged peek into the dancer's world. The fairy-like Princessa ushers readers into New York City's famous School of American Ballet (SAB) in Lincoln Center for the Performing Arts--the finest dance academy in the U.S. and the starting point for most of the New York City Ballet's ballerinas. Through stunning photography, they'll enter SAB's classrooms and get an intimate look at how elite dancers train. The visit begins in a pre-ballet class, moves to SAB's Children's Ballet Division (11-year-olds), and finally arrives at the near-professional Advanced Ballet classes (16-year-olds). Along the way, newcomers to ballet will learn about the school's dress code; see close-up images of young students demonstrating all the basic positions; and find out what goes into performing each step. Just like a real dance class, the book opens with a barre--where dancers warm up--and then shifts to the center, where ballerinas can show off their balance, perform combinations, and eventually practice partnering. (There's also a glimpse at boy's class, too!) The on-the-page performance is absolutely inspiring, with every dancer in perfect, elegant form: all the photos and instructions have been checked by the teachers at SAB for accuracy. And most exciting of all is watching a girl get ready to go on stage for a dress rehearsal, applying her makeup, straightening her costume, and making sure every hair is in place. It's the stuff of which dreams are made, and the finest children's introduction to ballet ever published! Co-Authors, friends, business partners, and fellow moms, Stephanie Troeller and Mary Kate Mellow are the producers of the "Prima Princessa Presents" series of ballet DVDs for children. They are passionate about everything ballet. You can visit them online at www.PrimaPrincessa.com. Stephanie studied dance in Paris, France at Marcel Marceau's International School of Mimodrame of Paris and at Martha Graham in NYC. She graduated from Columbia University, Barnard College, and went on to pursue a career in cartoons. Stephanie is the writer of her self-syndicated comic "Relationstrips" and the proud designer of the fabulous ballerina princess "Prima Princessa." She lives in Montclair, NJ with her husband, four great kids, and puppy, Max. Mary Kate is a dance lover and former jewelry designer. Her jewelry has appeared on the cover of Seventeen magazine and in Women's Wear Daily. Mary Kate graduated from Wesleyan College in Connecticut. She lives Montclair, NJ with her husband, two wonderful children and their Maltese, Pickles.